Michigan has an abundance of lakes and streams that are not only beautiful, but are perfectly tailored to the wonderful pastime of kayaking. Whether you like swift-moving streams with some action, or idyllic ponds and lakes for smooth gliding, you’re sure to find what you’re looking for not far from where you live. One such place to experience this pastime is Ludington State Park. Within the park are several options to satisfy the explorer in each of us. Upon entering the park, you’ll see the Sable River as it wends its way from Hamlin Dam and empties into Lake Michigan. Although a very short trip, it is a suitable introduction for beginners to float around and get comfortable in their kayak. Further into the park you will find a lovely beach on the shores of Hamlin Lake. If you are in need of a rental, you can visit the Hamlin Concession and Canoe Rental. They have a variety of kayaks, canoes, and paddle boats. There is also a well designed boat ramp, and ample parking for those who bring their own craft. 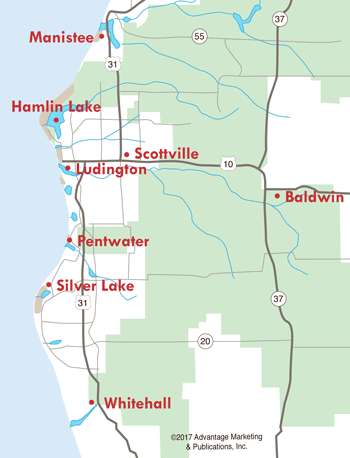 Both beginners and experienced kayakers can stop in and pick up a map of the Ludington State Park Canoe Trail. The trail is an enjoyable paddle and can be enjoyed by even novice kayakers. The trail follows the shoreline of Hamlin Lake for four miles, but many people just take on portions of the trail. Prepare to spend up to three hours for your trip and plan to portage the marshy areas. Keep in mind that early morning forays require lots of bug repellent. In addition, you want to bring your sunscreen and bottled water. Keep a sharp eye out and bring your camera, as it is not uncommon to spy bald eagles along this trail. 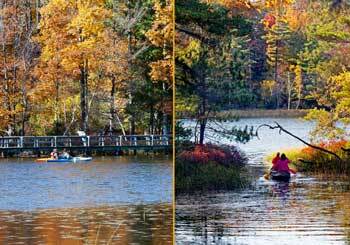 One area in the park that is a true Michigan gem is Lost Lake. Launching from Hamlin Concession and Canoe Rental and going left along the shore of Hamlin Lake will take you to a small inlet with a footbridge rising over it. Maneuver your kayak under the bridge and you will find yourself on Lost Lake, a small section carved into a wooded area between Hamlin Lake and Beechwood Campground. Gliding along on Lost Lake, you’ll pass a boardwalk and a small island next to the campground. But paddle beyond that and you’ll find yourself on a beautiful little lake dotted with hundreds of water lilies. As you reach the far end of the lake you’ll discover another foot bridge. Paddling under this will take you out along the shores of Hamlin Lake. As you follow the shoreline, you’ll discover many inlets and small islands. The area is teeming with wildlife; swans, ducks, deer, eagles, and more may be seen in this area. Kayaking here in early spring, you may discover wildlife tending to their newborns. Ludington State Park has so much to offer the kayaker. 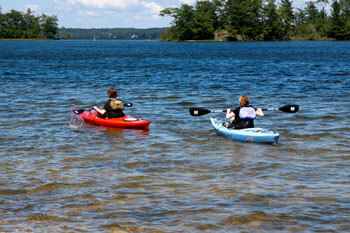 Kayaking is a wonderful outing for couples, families, or even the soloist looking for solitude. So gather up your gear and your loved ones, and head out on the water for some fun! Article and photos by Craig Sterken Photography. Hamlin Lake Area Canoeing and Kayaking -- Hamlin Lake offers so many neat areas to explore on a canoe, kayak, or stand up paddle board, including upper Hamlin Lake and three different bayous. Canoe or Kayak the Pere Marquette River near Scottville -- The moderately fast current, the clear water, and the low degree of stream bank development have all helped to make this river a mecca for those who canoe or kayak. Explore the Lakes and Rivers of Pentwater -- Paddle the forks, estuary, and the head of Pentwater Lake on a canoe, kayak, or stand up paddle board.